About 52 kilometres north of Leh in the far upper reaches of India lies the highest motorable road in the world. Situated proudly at an altitude of 18,380ft, Khardung La winds its way through the heart of the rugged and sparsely populated Ladakh, a region in the sub-continent’s northernmost state of Jammu and Kashmir. Khardung La (La means ‘a pass’ in Ladakhi) is periodically trod by adventure-seeking bikers and military personnel trucking supplies to the Siachen Glacier and has a mesmerising effect on people who visit it. Cold, mystical and beautiful, bathed in blue sky and sunshine, this destination could be every adventure biker’s dream. 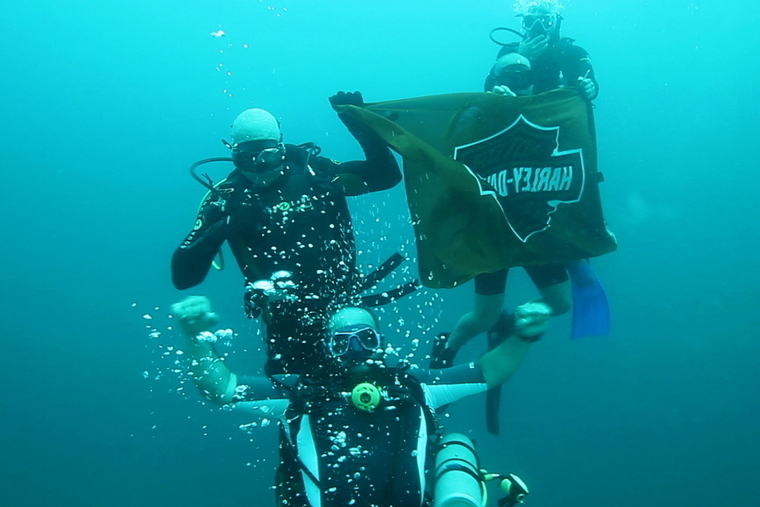 Enamoured by the legendary tales that are born in this region, Ankush along with Yunus, a technical engineer at Mumbai’s Seven Islands Harley-Davidson, set out on June 16, 2011 for the journey of their lifetime. With Ankush astride the iconic Harley-Davidson Fat Boy and Yunus seated in a backup vehicle, the pair toured all the way from Mumbai to Khardung La and back, via Kargil, Kashmir and Jammu, covering an incredible 5,500km in a record 14 days and officially becoming the first ever H.O.G member to achieve the feat. “I was catching up with a couple of my riding buddies and we soon got talking about all the interesting adventure stories that surround Khardung La. Ideas started to form and we all got extremely excited about the prospect of tackling the pass with our own motorcycles. “Although unforeseen circumstances forced my buddies to back out at the last minute, I was still determined to take on Khardung La. 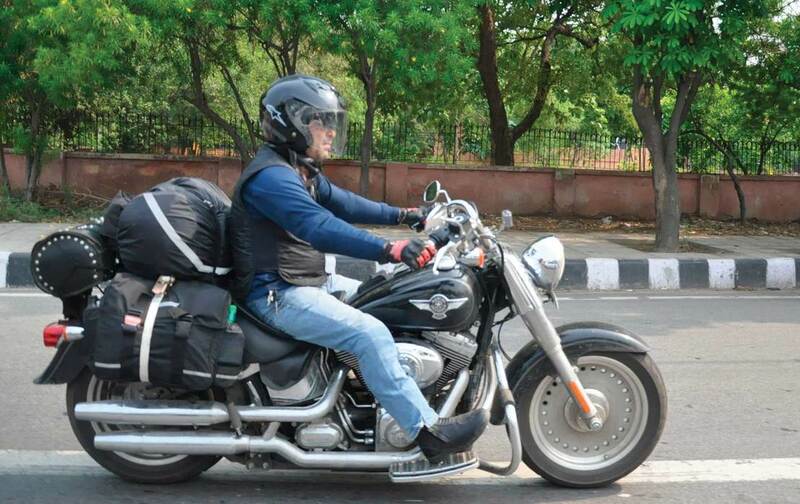 My prized possession – the 2011 Harley-Davidson Fat Boy – was my chosen ride for this expedition. 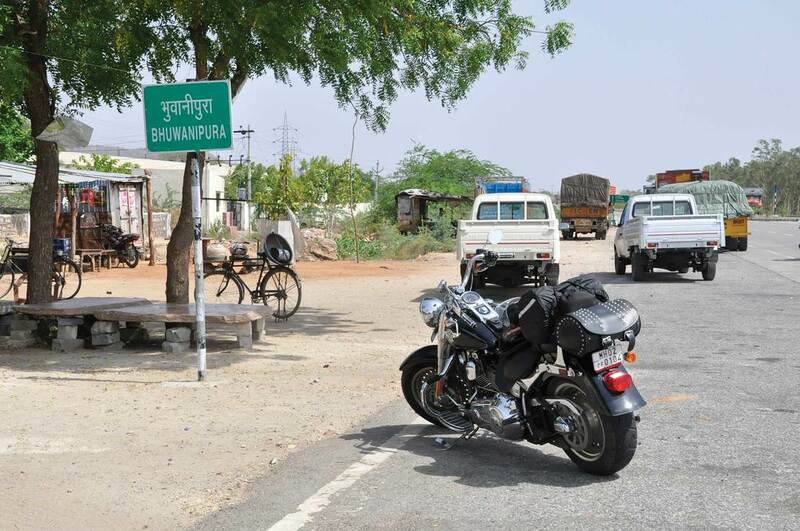 “Understanding the strenuous nature of the planned journey, I reached out to Seven Islands Harley-Davidson, the company’s Mumbai dealership, to seek support. 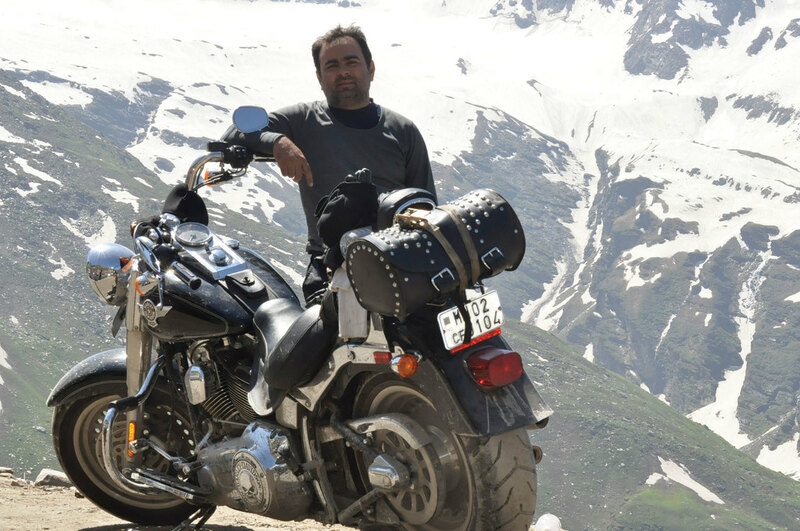 The dealership showed interest and Yunus was the first to jump at the prospect of a Harley-Davidson making it up to the world’s highest motorable pass. He immediately decided to team up with me to provide any technical support that might be required during the expedition. “In consultation with the dealership and some riding enthusiasts who had done this before on other bikes, I carried out key modifications to the Fat Boy – adding a protective plate to the underbody and stripping the bike down to the bare minimum in terms of accessories. Though Yunus and I understood the preparations that needed to be undertaken for this trip, nothing could really prepare us for what lay ahead. “We set off from Mumbai and for the next three days rode relentlessly through some of the best highways in India. Riding through Maharashtra, Gujarat and Rajasthan we took in the breathtaking views of the Western Ghats and the Thar Desert, and experienced both the monsoons of the western belt and the smouldering heat of the plains in Punjab and Haryana. 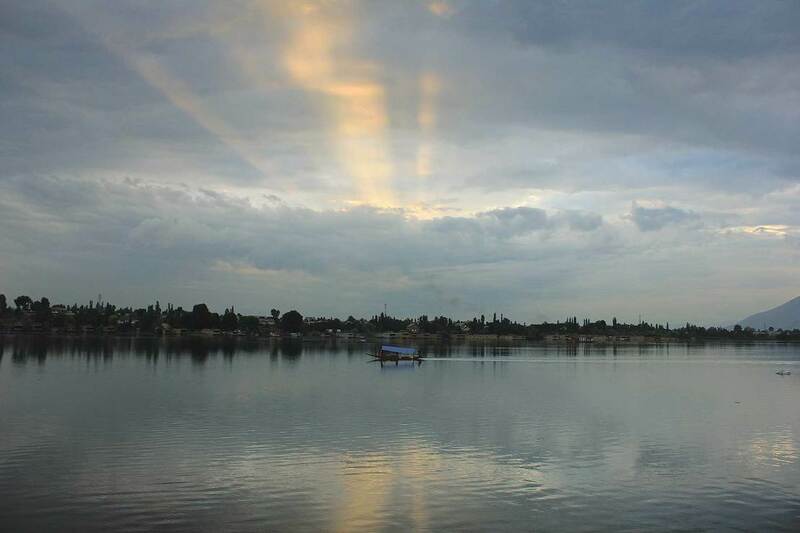 We arrived in Chandigarh completely dehydrated by the soaring temperatures of the region and eagerly awaited the cooler mountain terrain to begin. “We followed the course of the Beas River to the historic town of Mandi and cruised along the twists and turns of the expansive hills until we reached the hill station of Manali. The locals were extremely warm, friendly and willing to help and a simple query on directions always led to conversation. They were eager to know where we came from and where we were headed and their eyes would open wide when we told them that I had ridden all the way from Mumbai. “The amount of attention that the Fat Boy got was unprecedented. Huge crowds gathered around the bike when we stopped and I was inundated with questions. Harley-Davidson has only recently made an appearance on the Indian biking scene and the Fat Boy proved to be a real attention-grabber! “We decided to stop over for the night at Manali as fatigue finally started setting in. In hindsight I shouldn’t have given in to the temptation to open the throttle, as it hadn’t given me the time to acclimatise to the thinner atmosphere. It was cold the next morning and knowing what lay ahead we started off early, feeling refreshed by our rest. “The road started ascending almost immediately after Manali, cutting through tiny villages and numerous streams. The villages were bustling with daily activity but progress slowed as we had to contend with both traffic and shepherds grazing their herds. As the destination came closer, my determination to complete this expedition only strengthened but after a short distance we came to a police checkpoint – the way was closed to tourists on Tuesdays! There was no way we were going to get bogged down with this minor obstacle and after a bit of persuasion we got a special go-ahead from the policemen to continue the expedition. 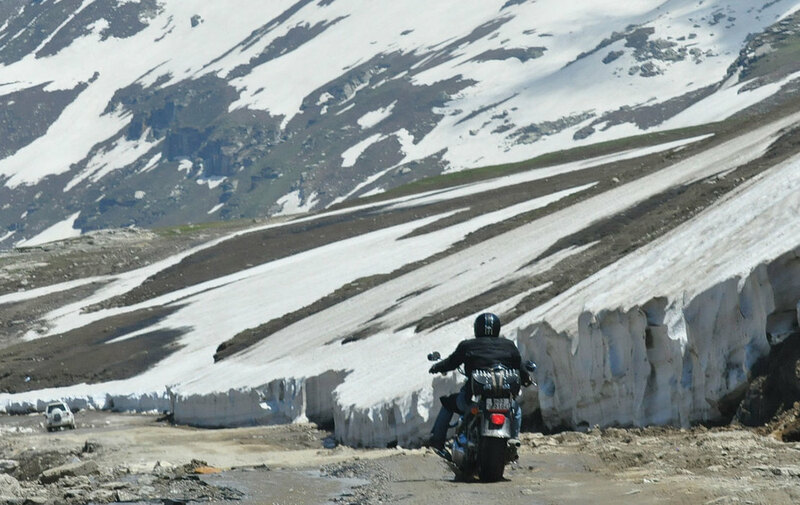 “The next destination was the Rohtang Pass, which in local language means ‘pile of corpses’, referring to numerous lives lost in the past due to the unpredictable weather conditions and bad roads. Indeed, the road conditions deteriorated as we continued and, with aching arms and legs, controlling the Fat Boy became increasingly difficult. With exhaustion from the journey catching up, it became harder to distinguish between a road and a stream. I had to be extremely cautious and couldn’t speed – there were times when despite riding for two hours straight we covered only 15km, but none of this deterred my determination to press forward. “Along the way, we encountered many bikers facing problems with their bikes conking out, clutch plates giving in and tyres being punctured. 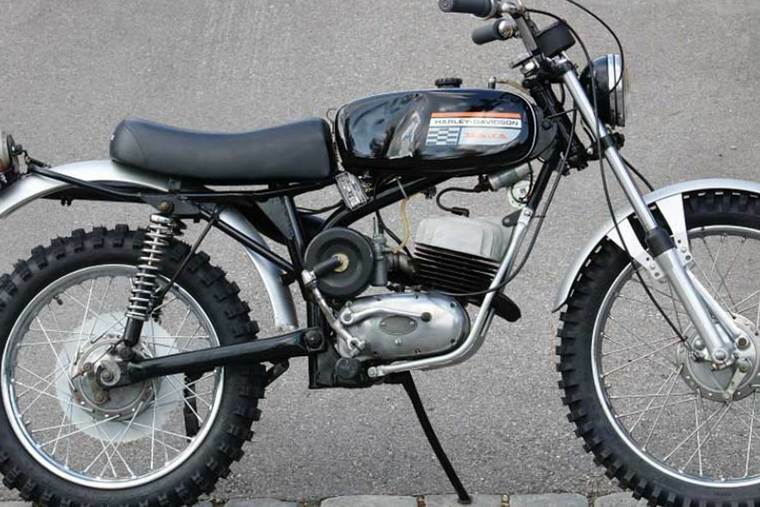 This reassured me of my decision to undertake the journey on the Fat Boy; a bike built to last. “The next stage was even slower as a recent landslide left us waiting for six hours as the road was repaired but finally, after a long, treacherous ride, we had conquered the Rohtang Pass. All the chaos of traffic and people disappeared and realisation slowly dawned on us that we had reached the point of no return. “We were heading to Jipsa for the night and on the way bumped into two Swedish women on bicycles following the same route. We also met some French riders who were fascinated to see the Harley at this altitude. After a night of rest, Yunus and I had our eyes set on the next stop – Sarchu. With no fuel pumps for the next 327km we stocked up fuel in the backup vehicle and set off. “We passed through some beautiful sights such as Deepak Lake and Baralacha Pass but the distance of 135km took over 10 hours and I was starting to notice the symptons of Acute Mountain Sickness. It seemed that nothing could have prepared me for the harsh conditions of this journey. We eventually reached Sarchu, a military base camp on the border of Himachal Pradesh and Jammu and Kashmir, and put up our tents to spend the night. The oxygen levels were very low and a week of relentless riding had finally started taking a serious toll on my health. For the first time my determination took a hit and I questioned my judgement in undertaking this immense trip. “Thankfully, the next day brought with it a fresh burst of energy and revived spirits as Yunus and I set our eyes on Leh, a small town surrounded by rugged mountains and our penultimate destination – just 37km away from Khardung La. “We toured along the beautiful bends of TangLang Pass and navigated the famous hairpin bends of 21 Gata Loops that wind their way up to a height of over 15,000 feet. 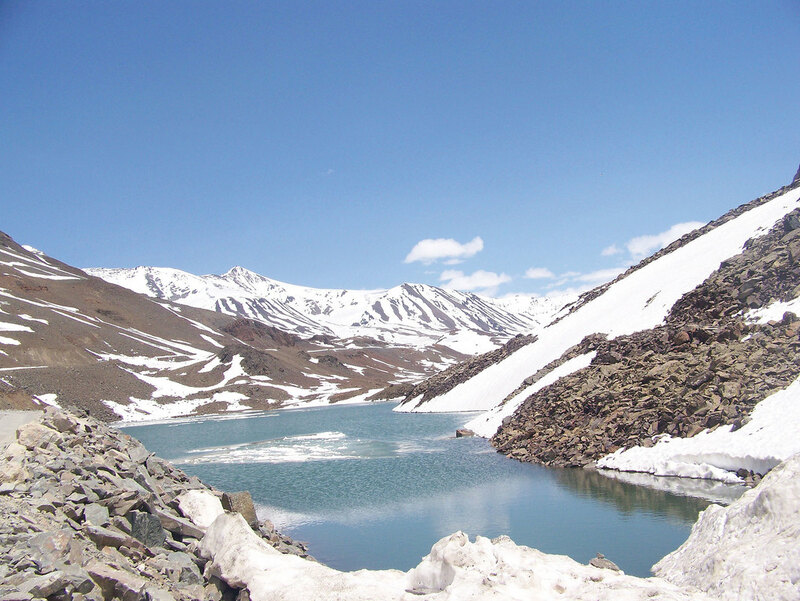 The road to Leh was around 500km of dry, rugged terrain with rivulets of snow that collected in the crevasses. We faced heavy challenges caused by some of the toughest road conditions we had encountered, including crossing streams and swollen rivers, to broken bridges and climbing unbelievably steep mountain roads. Despite being down with fever and severe body ache, I was reluctant to give up, and I finally managed to ride into Leh on my beloved bike. “However, the conditions had been harsh and Yunas realised the severe effect the ride could be having on my health. He called for medical assistance as we stayed in Leh and, post-examination, I was advised to cancel the remainder of the trip immediately and get back home. My exhausted body was not coping with the lack of oxygen at this high altitude and there was a risk of losing my eyesight due to the blood clots that had started developing in my right eye. 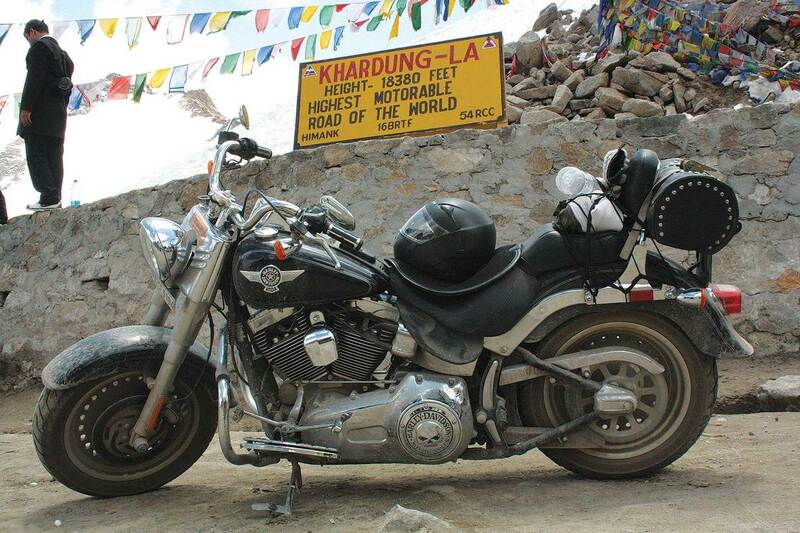 “This was a brutal dent in my dream of taking the Fat Boy up to Khardung La. Who could’ve thought that after going through all of the above, the one thing that would prevent me from completing the journey would be the lack of time taken to acclimatise! After several bouts of arguments, discussions and pleading, the sensible decision of returning home prevailed. “My one condition was that Yunus should ride the Fat Boy up to Khardung La to make it the first ever Harley-Davidson bike on the world’s highest motorable pass. Yunus, equally excited about the feat, jumped at the thought and agreed immediately. Having come all the way up to Leh, it was only fair that my Fat Boy completed the expedition I had set out for. While I packed my bags, slightly dejected yet proud to have my Fat Boy continue the journey, Yunus geared up for the final leg of the expedition. “The next morning the skies were crystal clear and the weather perfect for the final stretch. On the last 38km and with the goal almost in reach, Yunus was greeted with road signs proclaiming “You are nearest to Heaven and can have a dialogue with God.” Spurred on by these messages and filled with excitement, Yunas upped his tempo and sped through the incredible scenery. “With emotions running high, Yunus reached Khardung La faster than he had expected. He rode the Fat Boy right up to K-Top, the pinnacle of the mountain pass, and placed it there with an immense sense of pride. One deep breath of the crisp mountain air on K-Top and the entire journey made sense. “Khardung La was not just about the 38km stretch from Leh, but the 5,500km stretch from Mumbai and some of the toughest road conditions in the world. It was a ride Yunus and I would cherish for life. “I believe such trips are going to become an annual event for H.O.G. riders now that we’ve shattered the apprehensions about a big bike being able to manage one of the toughest stretches in the world. 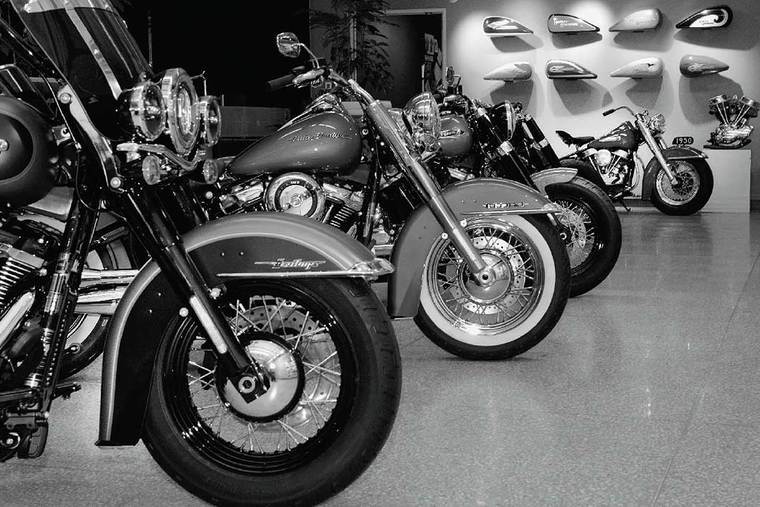 Harley-Davidson bikes are perfect for leisure riding across all terrains and the H.O.G. riding culture developing in India is only set to grow stronger with such rides. “Suspension, clearance and customisation proved to be the most important mechanical factors to consider before venturing out into this one-of-a-kind expedition. Build up your stamina and stock up on indicators, mirrors and puncture kits. Be prepared to scratch the bike, and deal with fatigue and emotional duress; it isn’t easy but you have to keep yourself going. “Naturally, I’m a little disappointed that I couldn’t make it right up to K-Top, but with Yunus my Fat Boy achieved what I’d set out for. Nevertheless, this has to be the best road trip I’ve ever taken on and I’m sure this is just the beginning of many more exciting expeditions with the bike in the future.